Bokos one-piece sandals stand up to wear and tear thanks to a lack of seams. And because there are no creases, nooks, or crannies, they stay cleaner, too. Bokos were built by brothers Matt and James McManus, on a quest to create their ideal sandals. Top on their sandal must-haves list: simple design, durable construction, and affordable price. 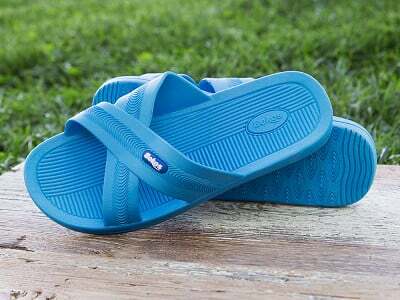 Made from a single piece of non-porous rubber, these sandals repel dirt and odors while being surprisingly lightweight and durable. They can go in and out of the water or shower with no problem. Need to clean them? Just rinse and dry. Hello, Grommet fans! 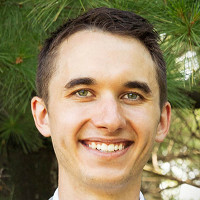 My name is Matt McManus, I am the owner of Bokos, a Minneapolis-based, family-owned footwear company. I am very excited to introduce you to Bokos, and I look forward to answering your questions about our brand! 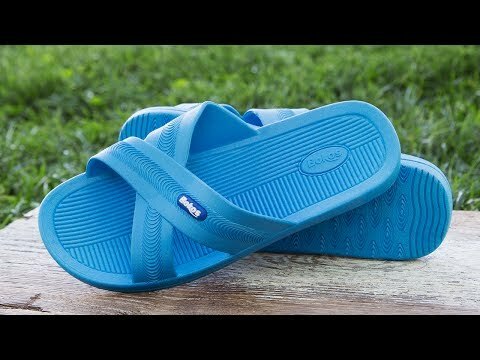 I hope that you find our comfortable, easy-to-clean, anti-odor slide sandals as exciting and appealing as our current customers do! Hello - somehow rubber seems like it would be sweaty on the feet and become slick too. How do they do as the day goes on? Matt, I was all set to buy! Big problem I wear a 10 1/2 or 11! Your sizes for women stop at 10! What's up with that? Women are taller these days. @Dorothy My apologies! As a small company we're still a bit limited by tooling costs and other restraints. We're hoping to expand into larger women's and men's sizes by this time next year. Although the colorways aren't the same, a men's 9 or 10 may suffice for your needs. I wear a 9 1/2 wide in a woman's shoe. How wide are these? Looking for a low maintenance gardening shoe. Considering ordering a 9 in the men's. @Denise I don't have the exact width measurements handy at the moment, but these generally fit a bit wider. Some people with thinner feet have said they're too roomy, so these will likely be perfect for you. You may want to even consider a women's 10 i/o of men's 9. Hi Matt! My biggest concern is slipping. I'm older (still love my flip-flops) but have become very hesitant at wearing them wherever there's moisture. I've slipped twice with good quality sandals lately because they just slide when wet. Are these REALLY safe to wear around slippery surfaces? @Robin Hi Robin! Thanks for reaching out! In our experience and from customer feedback we received, these have proved to be anti-slip on a multitude of services. From personal experience they have slipped a bit on ice when I was taking the trash out in the winter, but then again sandals aren't the typical footwear for walking on ice. @Sheri Hi Sheri! If you don't have a wider foot, then you could likely go with a size 9 i/o of 10. Hi Matt! I was excited to see these sandals created by a fellow Minnesotan. I may be one of those who would wear them to take out the garbage - carefully, as you said you have. However, there doesn't seem to be much, if any arch support. Is the photo just at a poor angle? Or are my aging eyes fooling me? @Linda Hi Linda! Thanks for the feedback. Minnesota isn't the first place people think of when they hear 'sandals', but we're trying to change that :). Bokos do have a neutral foot bed, so if you need aggressive arch support they might not be the best fit. It hasn't been much of an issue with our customers, but it's not inline with more orthopedic styled sandals that are out there. However, we frequently receive feedback about how comfortable they are. Thanks Matt! The arch support wouldn't be an issue for my husband, but might be for me. I'll have to start with a pair for him, & maybe "borrow" them on occasion. Btw, I do wear my sandals year round here in Minnesota, so you're not alone! @Linda Glad we're not the only ones! Bokos are convenient for kicking on because you can easily slide your feet in and out with socks on. @Stephen Hi Stephen. Thanks for reaching out. We have two green options for men's - Military Green and Lime. The Military Green is like olive green and the Lime is much more vibrant - like 'highlighter' green. Should I order my regular size or is there a need to size up or down? My normal size is an 8 (male) USA. @Robert Hi Robert. We suggest ordering your regular size. You should be good with a Men's 8. Hi! Do you use recyclable rubber for these sandals? Thanks for your time! @S Hi Bokos are not made from recycled material, but the compound they're made from is recyclable. @Mikki We currently have an order in production that includes women's black, that should be complete by end of July. Do these contain latex? I am allergic. @S Rebecca Hi Rebecca! Bokos do not contain latex, they're a PVC compound. @Wendy Hi Wendy! Thanks for reaching out. The footbed is quite soft. We've received a few notes from customers who have medical foot problems and Bokos worked for them when other sandals have not. Bokos one-piece sandals stand up to wear and tear thanks to a lack of seams. And because there are no creases, nooks, or crannies, they stay cleaner, too. Bokos were built by brothers Matt and James McManus, on a quest to create their ideal sandals. 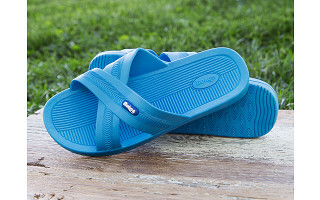 Top on their sandal must-haves list: simple design, durable construction, and affordable price.